Comments: “A Show of Hart” Here Bret the Hitman Hart makes his WWE debut. It is so great to see all these older living legends of wrestling. Here we do get a good look at Bret he was, is and always will be the best. This Canadian Icon is a legend among legends. The art shows him off perfectly as well as the other wrestlers. You feel his greatness in this story. “King of the Bling” Ted and Ramon are both clients at the same jewelry store. These two tough wrestlers do get into it and only one walks out. Money is not everything but it is nice to have. In a fight though it does not help at all. Both wrestlers are drawn exactly like their real-life counterparts. “The Royal Treatment” The art is done in a simple style which is good for a younger audience. The Junkyard Dog and Harley Race with Bobby the Brain put on a show in the ring. They are all greats from the past that it is wonderful to see. “Internal Audit” Money Incorporated is formed. Ted and Irwin do go together well. The story is interesting and the art spot on illustrating these two wrestlers. “The Brain vs. the Bulldog” Its Bobby the Brain Heenan vs Matilda the bulldog. The art shows off the characters wonderfully just as you would expect them to look. Poor Bobby finds being a weasel can get you a bulldog and a snake after you. Matilda does have fun. 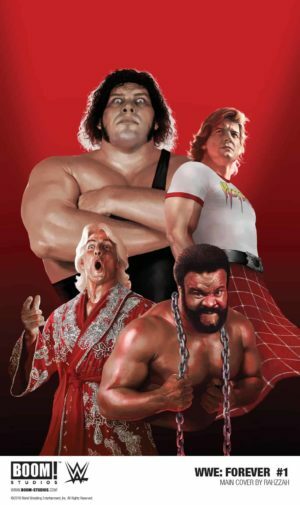 Any fan of WWE will love this book. It is full of classic superstars that will give you a feeling of nostalgia.